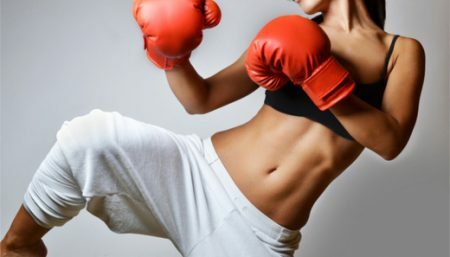 Looking for an effective cardio workout, kickboxing is here for you as it engages almost every muscle in your body. It tones your arms, abs, shoulders, back, and legs at the same time. It’s an amazing stress release. Note: Perform each drill back to back without rest. When you’ve finished the last drill, rest for 1-2 minutes and repeat the full circuit one more time. 1. Jab, Cross, Squat, Jump and Switch: To begin with, stand with your right foot forward, arms in ‘on guard’ position (elbows bent, hands in fists on either side of your chin). Throw a right jab (punch your right arm forward, rotating your fist down, without locking out your elbow), a left cross (punch your left arm forward, rotating your left hip into the punch and lifting your left heel off the floor), and then bring your arms back to on guard position. Quickly push your hips back and lower into a squat, jump up, and rotate 180 degrees in the air, landing with your left foot forward. Immediately repeat the entire sequence on the left side. Continue alternating sides for 1 minute. 2. Side Kick: This kick is the strongest, because the force comes from the glutes. Keep your foot flexed as you kick out. Stand with your left foot forward in fighting stance. Turn hips to the right, and pivot right toes out slightly.Lift your left knee toward the chest, keeping your foot flexed . Forcefully extend the left leg out to the left side, pushing through the heel while counter-balancing by leaning your entire upper body toward the right. Keep hands in fists near face. Retract the kick and immediately return to fighting stance. 3. Boxer’s Shuffle and Switch: With your right foot forward and arms on guard, shuffle in place for 1 count, then quickly jump and switch to the other side, landing with your left foot forward. Shuffle in place for 1 count and switch back. Do this as quickly as you can for 30 seconds. 4. Back Kick and Knee Strike: Stand with your feet together, arms on guard. Bend your left knee in towards your chest, and then extend your left leg behind you, pushing out through your left heel, foot flexed. Quickly bend your knee back in and step down. Immediately bend your right knee in front of your chest, pressing your hips forward. Repeat for 30 seconds with the left leg, and then 30 seconds with the right. If you want to make this more challenging, add a hop as you transition from the kick to the knee strike. 5. Horse Stance to Push-up, Pop-up: Begin in horse stance with your feet wider than hip-width apart, knees bent, and toes turned out about 45 degrees. Bring your arms to on guard, keeping your hips under your shoulders. Bend from your hips to place your hands on the ground below your shoulders. Jump both feet back into a full plank (keeping your abs in tight). Do a pushup and then jump your feet back into your hands and stand back up into horse stance. Repeat as many times as you can for 1 minute. Practice each combination in this 10-minute fat blaster slowly at first, then increase your speed as the routine becomes more familiar.